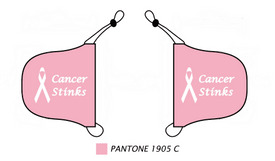 Our Cancer Stinks Mirror Car Flag slips easily over your car mirrors without hindering your view! They are a great way to show your support for someone with cancer - tell it like it is: Cancer Stinks! The Spandex material (bathing suit-like material) of these mirror covers allows for some give, easy installation, dries quickly and is very durable. The elastic allows for these to slip on and off easily in just a few seconds. Helps protects your car frame mirror from scratches and bugs. Each cover works like a sock for your car mirror, simply sliding over in order to fit most cars - covers all but the mirror! Unfortunately, because of their larger mirror sizes, these will not fit mini vans, pick-ups and trucks.